In calling off Operation Sea Lion, Adolf Hitler, the Supreme Commander of the world's most powerful armed forces, had suffered his first major setback. Nazi Germany had stumbled in the skies over Britain but Hitler was not discouraged. In the past, he had repeatedly overcome setbacks of one sort or another through drastic action elsewhere to both triumph over the failure and to move toward his ultimate goal. Now it was time to do it again. All of Hitler's actions in Western Europe thus far, including the subjugation of France and the now-failed attack on Britain, were simply a prelude to achieving his principal goal as Führer, the acquisition of Lebensraum (Living Space) in the East. He had moved against the French, British and others in the West only as a necessary measure to secure Germany's western border, thereby freeing him to attack in the East with full force. For Hitler, the war itself was first and foremost a racial struggle and he viewed all aspects of the conflict in racial terms. He considered the peoples of Western Europe and the British Isles to be racial comrades, ranked among the higher order of humans. The supreme form of human, according to Hitler, was the Germanic person, characterized by his or her fair skin, blond hair and blue eyes. The lowest form, Hitler believed, were the Jews and the Slavic peoples of Eastern Europe, including the Russians. Therefore, in stark contrast to the battles so far in the West, Hitler intended the quest for Lebensraum in the East to be a "war of annihilation" utilizing the might of the German Army and Air Force against soldiers and civilians alike. In March of 1941, he assembled his top generals and told them how their troops should behave: “This struggle is one of [political] ideologies and racial differences and will have to be conducted with unprecedented, unmerciful and unrelenting harshness. All officers will have to rid themselves of obsolete [moral] ideologies…I insist absolutely that my orders be executed without contradiction." Hitler then ordered the killing of all Russian political authorities. "The [Russian] commissars are the bearers of ideologies directly opposed to National Socialism. Therefore the commissars will be liquidated. German soldiers guilty of breaking international law…will be excused.” His generals listened in silence to this command, known later as the Commissar Order. For his most senior generals, the utterances of their Supreme Commander posed a dilemma. They were mostly men of the old-school, born and raised in Imperial Germany, long before Hitler, amid traditional morals of bygone days. Now, they felt duty-bound to follow Hitler’s orders, no matter how drastic, since they had all sworn an oath of obedience to the Führer. But to comply, they would have to abandon time-honored codes of military conduct, considered obsolete by Hitler, which prohibited senseless murder of civilians. At the same time, they each owed a debt of gratitude to Hitler for restoring the Germany Army to greatness and for the slew of promotions bestowed upon them by the Führer in the wake of its continued success. Rank and privilege, and the immense prestige of holding the title of Colonel-General or Field Marshal in Hitler's Wehrmacht, had tremendous appeal for these men, Therefore, in the end, despite their misgivings, not one of them dared to speak up or refuse Hitler in regard to his war plans for Russia. Instead, they dutifully planned the invasion of Russia, knowing the attack would unleash an unprecedented wave of murder. The invasion plan for Russia was named Operation Barbarossa (Red Beard) by Hitler in honor of German ruler Frederick I, nicknamed Red Beard, who had orchestrated a ruthless attack on the Slavic peoples of the East some eight centuries earlier. Barbarossa would be Blitzkrieg again but on a continental scale this time, as Hitler boasted to his generals, "When Barbarossa commences the world will hold its breath and make no comment!" Set to begin on May 15, 1941, three million soldiers totaling 160 divisions would plunge deep into Russia in three massive army groups, reaching the Volga River, east of Moscow, by the end of summer, thus achieving victory. Facing them would be Stalin's Red Army, estimated by the Germans at 200 divisions. Although somewhat outnumbered by the Russians, Hitler believed they did not pose a serious threat and would fall apart just like their fellow Slavs, the Poles, did in 1939. 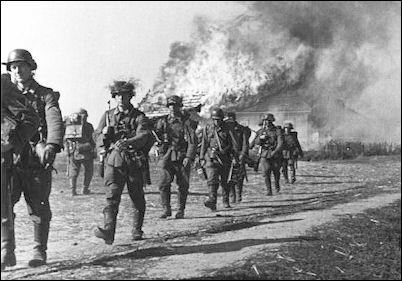 Against an army of battle-hardened, racially superior Germans, the Russians would be finished in a matter of weeks, Hitler claimed. Most of his generals concurred, supported by recent evidence. They had watched with keen interest as Soviet Russia confidently invaded Finland in November 1939, only to see the Red Army disintegrate into a disorganized jumble amid embarrassing defeats at the hands of a much smaller blond-haired Finnish fighting force. Buoyed by Hitler and awash in their own arrogance, the generals confidently finalized the details of Operation Barbarossa as the bulk of the German troops and armor slowly moved into position in the weeks leading up to May 15. But as the invasion date neared, complications arose that upset the whole timetable. Hitler's old friend and chief ally, Benito Mussolini, leader of Fascist Italy, had foolishly tried to imitate the Führer and achieve battlefield glory for himself by launching a surprise invasion of Greece. British troops stationed in the Mediterranean then moved in to help the Greeks fend off the Italians. For Hitler, the very idea of British troops in Southern Europe was enough to keep him awake at night. Their presence was a threat to Germany's vulnerable southern flank, the region of Europe known as the Balkans, which also supplied most of Germany's oil. It would therefore be necessary to secure the Balkans before launching Barbarossa. To quickly achieve this, Hitler slipped back into a familiar role – the political master manipulator – forging overnight alliances with two Balkan countries, Bulgaria and Yugoslavia. But in Yugoslavia, things unexpectedly spiraled out of control when the government, upon its alliance with Hitler, was immediately overthrown by its own citizens. Hitler was enraged by the news, perceiving it as a blow to his prestige. In a tirade, he ordered his generals to crush the country "as speedily as possible" and also ordered Göring's Air Force to obliterate the capital city, Belgrade, as "punishment." For the Luftwaffe, Belgrade was an easy target and they quickly turned it to rubble while killing 17,000 defenseless civilians. Meanwhile, beginning on Sunday, April 6, 1941, the Wehrmacht poured 29 divisions into the region, taking Yugoslavia by storm, then took Greece for good measure, forcing British troops there to make a hasty exit. Thus the Balkans were secured. However, these actions took nearly five weeks and caused a lot of wear and tear on tanks and other armored equipment needed for the Russian campaign. July 1941. A confident looking Hitler with Luftwaffe Chief Hermann Göring (right) and a decorated fighter pilot. 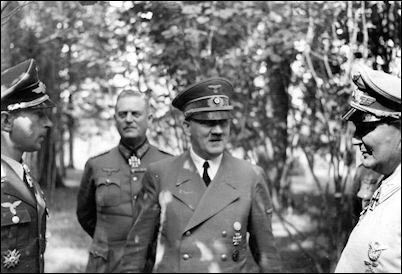 Behind Hitler is his chief military aide Wilhelm Keitel, now a Field Marshal. 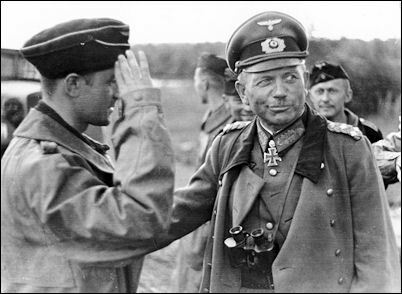 Below: General Heinz Guderian in Russia, full of confidence as well. The new launch date for Barbarossa was Sunday, June 22, 1941. On that day, beginning at 3:15 am, 3.2 million Germans plunged headlong into Russia across an 1800-mile front, taking their foes by surprise. Russian field commanders made frantic calls to headquarters asking for orders, but were told there were no orders. Sleepy-eyed infantrymen scrambled out of their tents to find themselves already surrounded by Germans, with no option but to surrender. Bridges were captured intact while hundreds of Russian planes were destroyed sitting on the ground. In attacking Russia, Hitler had indeed stunned the world. But he also made a lot of Germans very nervous. Maria Mauth, a 17-year-old German schoolgirl at the time, recalled her father's reaction: "I will never forget my father saying: 'Right, now we have lost the war!' " But then reports arrived highlighting the easy successes. "In the weekly newsreels we would see glorious pictures of the German Army with all the soldiers singing and waving and cheering. And that was infectious of course...We simply thought it would be similar to what it was like in France or in Poland – everybody was convinced of that, considering the fabulous army we had." Indeed, it was true. Whole armies of hapless Russians were now surrendering as the relentless three-pronged Blitzkrieg blasted its way forward. Soviet Russia had been caught unprepared due to the astounding negligence of the country's dictator, Josef Stalin, who had stubbornly disregarded a flurry of intelligence reports warning that a Nazi invasion was imminent. Hitler and the Army High Command were now poised to achieve the greatest military victory of all time by trouncing the Russians. At present, three gigantic army groups were proceeding like clockwork toward their objectives. Army Group North, with 20 infantry divisions and six armored divisions, headed for Leningrad (now St. Petersburg) by the Baltic Sea. Army Group Center, the largest, with 33 infantry and 15 armored divisions, continued on its 700-mile-long journey toward Russia’s capital, Moscow. Army Group South, with 33 infantry and eight armored divisions, headed for Kiev, capital of the Ukraine, the breadbasket of Europe with its fertile wheat fields. Along the way, German field commanders employed their already-perfected Blitzkrieg techniques time and time again to pierce Russian defensive lines and surround bewildered Red Army soldiers. By mid-July 1941, all that remained was for the Russians to give up and accept their fate under Hitler, just like Austria, Czechoslovakia, Poland, Norway, Denmark, Belgium, Luxembourg, Holland, France, Yugoslavia, and Greece. But the Russians kept fighting. October 1941. German infantrymen plunge ever deeper into Russia. 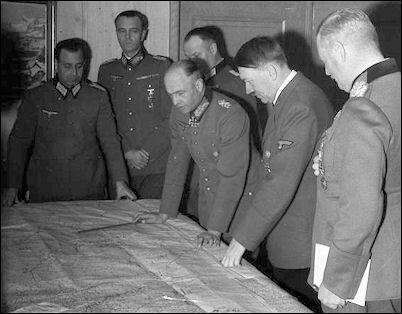 Below: Hitler at the map table with Army Commander-in-Chief Brauchitsch and others, including Friedrich Paulus (2nd from left). Despite staggering losses of men and equipment, pockets of fanatical resistance now emerged, unlike anything the Germans had encountered thus far in the war. And there were more surprises for the Germans. They had grossly underestimated the total fighting strength of the Red Army. Instead of 200 divisions, the Russians could field 400 divisions when fully mobilized. This meant there were three million additional Russians available to fight. Another emerging factor was the vastness of Russia itself. It was one thing to ponder a map, something else to traverse the boundless countryside, as Field Marshal Manstein remembered: "Everyone was captivated at one time or other by the endlessness of the landscape, through which it was possible to drive for hours on end – often guided by the compass – without encountering the least rise in the ground or setting eyes on a single human being or habitation. The distant horizon seemed like some mountain ridge behind which a paradise might beckon, but it only stretched on and on." The vastness created logistical problems including worn out foot soldiers and dangerously overstretched supply lines. It also taxed the ability of the Luftwaffe to provide close cover for advancing ground troops, a vital ingredient in the Blitzkrieg formula. On top of this, Russian resistance began to stiffen all over as the soldiers and people rallied behind Stalin in the defense of their Motherland. Stalin, at first overwhelmed by the magnitude of Barbarossa, had regained his bearings and publicly appealed for a "Great Patriotic War" against the Nazi invaders. Meanwhile, behind the scenes, he enacted ruthless measures, executing his top commander in the west and various field commanders who had been too eager to retreat. Under Stalin's tight-fisted grip, the chaos and panic that had initially enveloped the Russian officer corps gradually subsided. Red Army commanders took heed from Stalin, instilling his 'fight to the death' mentality in their frontline soldiers. They set up new defensive positions, not to be yielded until every last soldier was killed. They also began their first-ever counter-attacks against the advancing Germans. As a result, with each passing day the Germans began to lose momentum. They could no longer easily blow through the Russian defenses and had to be wary of counter-strikes. All the while, German foot soldiers were becoming increasingly fatigued. By August of 1941, it had become apparent to the Army High Command there would be no speedy victory. “The whole situation makes it increasingly plain that we have underestimated the Russian colossus,” General Franz Halder, Chief of the General Staff, had to admit. Therefore the question now arose – what to do – follow the original battle plan for Barbarossa or make changes to adapt? Army Group Center was presently about 200 miles from Moscow, poised for a massive assault. However, the original plan called for Army Groups North and South to stage the main attacks in Russia, with Army Group Center playing a supporting role until their tasks were completed, after which Moscow would be taken. A majority of Hitler’s senior generals now implored him to scrap Barbarossa in favor of an all-out attack on Moscow. If the Russian capital fell, they argued, it would devastate Russian morale and knock out the country’s chief transportation hub. Russia’s days would surely be numbered. The decision rested solely with the Supreme Commander. In what was perhaps his single biggest decision of World War II, Hitler passed up the chance to attack Moscow during the summer of 1941. Instead, he clung to the original plan to crush Leningrad in the north and simultaneously seize the Ukraine in the south. This, Hitler lectured his generals, would be far more devastating to the Russians than the fall of Moscow. A successful attack in the north would wreck the city named after one of the founders of Soviet Russia, Vladimir Lenin. Attacking the south would destroy the Russian armies protecting the region and place vital agricultural and industrial areas in German hands. Now, with Leningrad surrounded and the Ukraine almost taken, the generals implored Hitler to let them take Moscow before the onset of winter. This time Hitler consented, but only partly. He would allow an attack on Moscow, provided that Army Group North also completed the capture of Leningrad, while Army Group South advanced deeper into southern Russia toward Stalingrad, the city on the Volga River named after the Soviet dictator. This meant German forces in Russia would be attacking simultaneously on three major fronts over two thousand miles long, stretching their manpower and resources to the absolute limit. Realizing the danger, the generals pleaded once more for permission to focus on Moscow alone and strike the city with overwhelming force. But Hitler said no. In the meantime, German troops still holding outside Moscow had remained idle for nearly two months, waiting for orders to advance. When the push finally began on October 2, 1941, a noticeable chill already hung in the morning air, and in a few places, snowflakes wafted from the sky. The notorious Russian winter was just around the corner. At first it appeared Moscow might be another easy success. Two Russian army groups defending the main approach were quickly encircled and broken up by motorized Germans who took 660,000 prisoners. By mid-October, forward German units had advanced to within 40 miles of Moscow. Only 90,000 Russian soldiers stood between the German armies and the Soviet capital. The entire government, including Stalin himself, prepared to evacuate. Russian Winter. 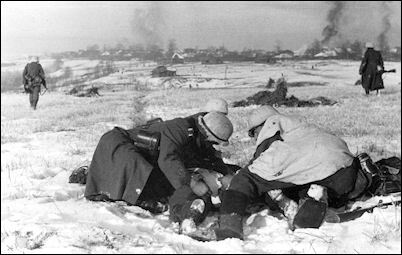 Near Moscow, a wounded German is rescued. 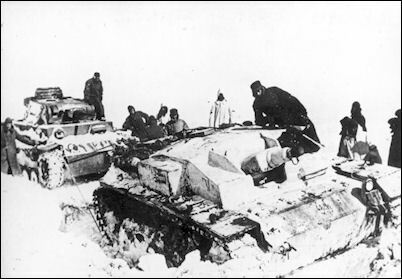 Below: A Panzer III tank stuck in the snow and cold as the whole offensive stalls. 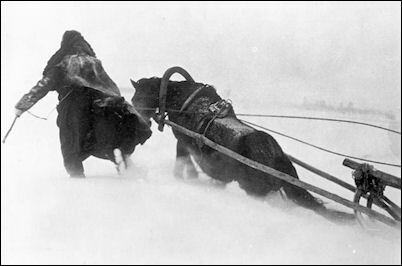 Below: Both men and horses are pushed to the limit amid the intense wind and deep snows. It began with weeks of unending autumn rain, creating battlefields of deep, sticky mud that immobilized anything on wheels and robbed German armored units of their tactical advantage. The non-stop rain drenched foot soldiers, soaking them to the bone in mud up to their knees. And things only got worse. In November, autumn rains abruptly gave way to snow squalls with frigid winds and sub-zero temperatures, causing frostbite and other cold-related sickness. Heavy boots, overcoats, blankets and thick socks were desperately needed but were unavailable. As a result, thousands of frostbitten soldiers dropped out of their frontline units. Some divisions fell to fifty-percent of their fighting strength. Food supplies also ran low and the troops became malnourished. Mechanical failures worsened as tank and truck engines cracked from the cold while iced-up artillery and machine-guns jammed. The once-mighty German military machine had now ground to a halt in Russia. Frontline Russians noticed the change. A Soviet commander in the 19th Rifle Brigade recalled: "I remember very well the Germans in July 1941. They were confident, strong tall guys. They marched ahead with their sleeves rolled up and carrying their machine-guns. But later on they became miserable, crooked, snotty guys wrapped in woolen kerchiefs stolen from old women in villages...Of course, they were still firing and defending themselves, but they weren't the Germans we knew earlier in 1941." Ignoring the plight of his frontline soldiers, Hitler insisted that Moscow could still be taken and ordered all available troops in the region to make one final thrust for victory. Beginning on December 1, 1941, German tank formations attacked from the north and south of the city while infantrymen moved in from the east. But the Russians were ready and waiting. The weather delays had given them time to bring in massive reinforcements, including 30 Siberian divisions specially trained for winter warfare. Wherever the Germans struck they encountered fierce resistance and faltered. They were also stricken by temperatures that plunged to 40 degrees below zero at night. Hitler had pushed his troops beyond human endurance and now they paid a terrible price. On Saturday, December 6th, a hundred Russian divisions under the command of the Red Army's new leader, General Georgi Zhukov, counter-attacked the Germans all along the 200-mile front around Moscow. For the first time in the war, the Germans experienced Blitzkrieg in reverse, as overwhelming numbers of Russian tanks, planes and artillery tore them apart. The impact was devastating. By mid-December, German forces around Moscow, battered, cold and tremendously fatigued, were in full retreat and facing the possibility of being routed by the Russians. Just six months earlier, the Germans had been poised to achieve the greatest victory of all time and change world history. Instead, they had succumbed to the greatest-ever comeback by their Russian foes. By now a quarter of all German troops in Russia, some 750,000 men, were either dead, wounded, missing or ill. Reacting to the catastrophe he had caused, Hitler blamed the Wehrmacht's leadership, dismissing dozens of field commanders and senior generals, including Walther von Brauchitsch, Commander-in-Chief of the Army. Hitler then took that rank for himself, assuming personal day-to-day operational command of the Army, and promptly ordered all surviving troops in Russia to halt in their tracks and retreat not one step further, which they did. As a result, the Eastern Front gradually stabilized. In the bloodied fields of snow around Moscow, Adolf Hitler had suffered a breathtaking defeat. The German Army would never be the same. The illusion of invincibility that had caused the world to shudder in the face of Nazi Germany had vanished forever – replaced now by a sliver of hope. But for the populations of Eastern Europe and occupied Russia, there was much suffering yet to be endured. In cities and villages behind the front lines, Hitler's war of annihilation was fully underway, comprising the most savage episode in human history.